Prime Minister Theresa May speaking outside Number 10 Downing Street. Labour has demanded Theresa May kill off a no-deal Brexit as the price of talks with Jeremy Corbyn about finding a way out of the crisis that has paralysed Westminster politics. After seeing off a no-confidence vote called by the opposition leader, the Prime Minister announced she would invite party leaders in the Commons and other MPs in for discussions to get a Parliamentary consensus. But she appears to face an uphill struggle after all the opposition party leaders demanded scrapping the possibility of no-deal as a condition of progress, while Labour refused to even sit down with the PM until the concession was guaranteed. Mrs May did hold talks with Lib-Dem leader Sir Vince Cable, SNP Westminster leader Ian Blackford and Plaid Cymru's Liz Saville-Roberts late on Wednesday. But Downing Street refused to make such a concession, with the Prime Minister's official spokesman saying: "Want to leave with a deal but she is determined to deliver on the verdict of the British public and that is to leave the EU on March 29 this year." Asked by a reporter if he was "taking no-deal off the table" in response to the opposition leader's demand, the spokesman replied: "I am not." Mrs May made a short live television address to the nation late on Wednesday in which she said the talks had been constructive, adding: "I am disappointed that the leader of the Labour Party has not so far chosen to take part, but our door remains open." Mrs May also aimed remarks at Parliamentarians who voted against her Brexit plan on Tuesday, saying that "MPs have made clear what they don't want, we must all work constructively together to set out what Parliament does want". She added: "It will not be an easy task, but MPs know they have a duty to act in the national interest, reach a consensus and get this done." Anti-Brexit protesters outside of the Houses of Parliament. Mrs May will hold further talks with other groups, including MPs in her own party and the Democratic Unionist Party on Thursday. They will take place the day after she survived an attempt to oust her as Prime Minister, as MPs rejected Mr Corbyn's motion of no confidence in the Government by a margin of 325 to 306. 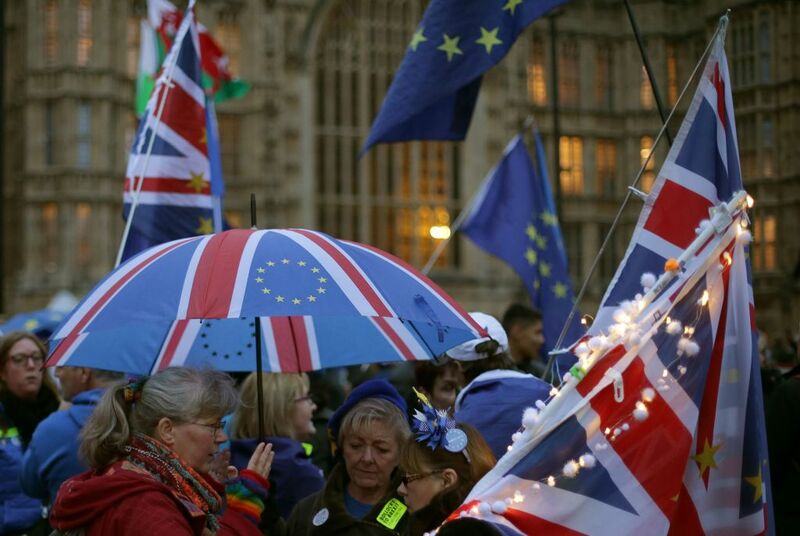 The Prime Minister's 19-vote victory came less than 24 hours after the huge defeat of her EU Withdrawal Agreement in the House of Commons, and clears the way for her to start cross-party talks on a Brexit Plan B. She pledged to approach the talks "in a constructive spirit" and urged other parties to do the same, adding: "I stand ready to work with any member of this House to deliver on Brexit and ensure that this House retains the confidence of the British people."